The feast of the Visitation of the Blessed Virgin Mary celebrates the visit of Mary, the Mother of God, with the child Jesus in her womb, to her cousin Elizabeth. The visit took place when Elizabeth was herself six months' pregnant with the forerunner of Christ, Saint John the Baptist. At the Annunciation of the Lord, the angel Gabriel, in response to Mary's question "How shall this be done, because I know not man?" (Luke 1:34), had told her that "thy cousin Elizabeth, she also hath conceived a son in her old age; and this is the sixth month with her that is called barren: Because no word shall be impossible with God" (Luke 1:36-27). The evidence of her cousin's own near-miraculous conception had called forth Mary's fiat: "Behold the handmaid of the Lord; be it done to me according to thy word." It is thus appropriate that the very next action of the Blessed Virgin that Saint Luke the Evangelist records is Mary's "making haste" to visit her cousin. Arriving at the house of Zachary (or Zacharias) and Elizabeth, Mary greets her cousin, and something wonderful happens: John the Baptist leaps in Elizabeth's womb (Luke 1:41). As the Catholic Encyclopedia of 1913 puts it in its entry on the Visitation, the Virgin Mary's "presence and much more the presence of the Divine Child in her womb, according to the will of God, was to be the source of very great graces to the Blessed John, Christ's Forerunner." John's leap was no ordinary movement of an unborn child, for as Elizabeth tells Mary, "as soon as the voice of thy salutation sounded in my ears, the infant in my womb leaped for joy" (Luke 1:44). The joy of John the Baptist, the Church has held from the time of the early Church Fathers, came from his cleansing at that moment of Original Sin, in accordance with the angel Gabriel's prophecy to Zachary, before John's conception, that "he shall be filled with the Holy Ghost, even from his mother's womb" (Luke 1:15). As the Catholic Encyclopedia notes in its entry on St. John the Baptist, "as the presence of any sin whatever is incompatible with the indwelling of the Holy Ghost in the soul, it follows that at this moment John was cleansed from the stain of original sin." Elizabeth, too, is filled with joy, and cries out in words that would become part of the chief Marian prayer, the Hail Mary: "Blessed art thou among women, and blessed is the fruit of thy womb." Elizabeth then acknowledges her cousin Mary as "the mother of my Lord" (Luke 1:42-43). Mary responds with the Magnificat (Luke 1:46-55), a canticle or biblical hymn that has become an essential part of the Church's evening prayer (vespers). It is a beautiful hymn of thanksgiving, glorifying God for choosing her to be the mother of His Son, as well as for His mercy "from generation until generations, to them that fear Him." The Visitation is mentioned only in Luke's Gospel, and Luke tells us that Mary stayed with her cousin about three months, returning home just before Elizabeth gave birth. The angel Gabriel, as we have seen, told Mary at the Annunciation that Elizabeth was six months pregnant, and Luke seems to indicate that the Blessed Virgin departed for her cousin's home very soon after the Annunciation. Thus, we celebrate the Annunciation on March 25 and the Birth of Saint John the Baptist on June 24, about three months apart. Yet we celebrate the Visitation on May 31—a date that doesn't make sense according to the biblical narrative. 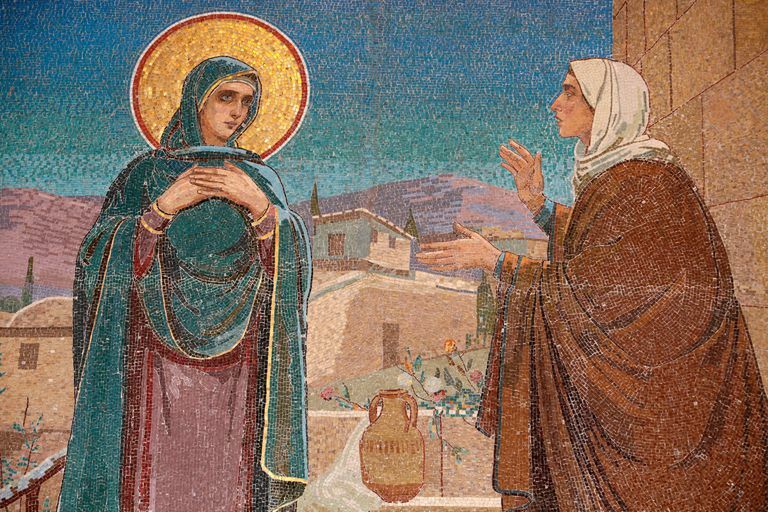 Why is the Visitation celebrated on May 31? While many Marian feasts are among the first feasts to have been celebrated universally by the Church, East and West, the celebration of the Visitation, even though it is found in Luke's Gospel, is a relatively late development. It was championed by Saint Bonaventure and adopted by the Franciscans in 1263. When it was extended to the universal Church by Pope Urban VI in 1389, the date of the feast was set as July 2, the day after the octave (eighth) day of the feast of the Birth of Saint John the Baptist. The idea was to tie the celebration of the Visitation, at which Saint John had been cleansed of Original Sin, to the celebration of his birth, even though the placement of the feast in the liturgical calendar was out of sync with the account given by Luke. In other words, symbolism, rather than chronology, was the deciding factor in choosing when to commemorate this important event. For close to six centuries, the Visitation was celebrated on July 2, but with his revision of the Roman calendar in 1969 (at the time of the promulgation of the Novus Ordo), Pope Paul VI moved the celebration of the Visitation of the Blessed Virgin Mary to the last day of the Marian month of May so that it would fall between the feasts of the Annunciation and the Birth of Saint John the Baptist—a time when Luke tells us that Mary would certainly have been with Elizabeth, taking care of her cousin in her time of need. "Catholic Bible: Douay-Rheims Bible Online, Verses Search." Catholic Bible: Douay-Rheims Bible Online, Verses Search. "St. John the Baptist." CATHOLIC ENCYCLOPEDIA: St. John the Baptist. "Visitation of the Blessed Virgin Mary." CATHOLIC ENCYCLOPEDIA: Visitation of the Blessed Virgin Mary.